On 16 October 2017, the Spanish bulk terminal operator European Bulk Handling Installation (EBHI) in the port of Gijón put a Konecranes Gottwald Model 8 Portal Harbor Crane into service. 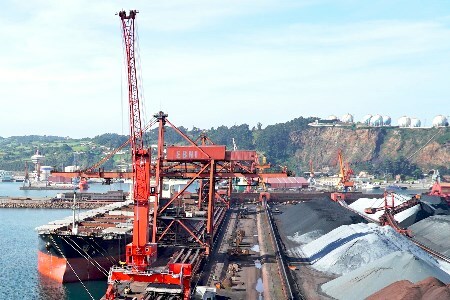 The crane, originally ordered in October 2016, will mainly be used for iron ore and coal unloading. This is the first portal harbor crane delivered by Konecranes to Spain. The new machine is the first Konecranes Gottwald Portal Harbor Crane purchased by EBHI. It will help the terminal to continue increasing its handling volume. The new Konecranes Gottwald Portal Harbor Crane for EBHI, a Model 8 crane in a four-rope-grab variant, offers a maximum lifting capacity of 100 t with a powerful 63 t grab curve and an operating radius of up to 50 m. The portal has a track gauge of 22 m and a clearance height of 6.125 m.